Mailbox smashing is a type of vandalism found most often in rural areas. The vandals drive along country roads at night and destroy roadside mailboxes with a heavy object, usually a baseball bat. This is a crime, and the perpetrators are often charged. Whether you are tired of replacing your mailbox or want to prevent it from being smashed in the first place, there are several things you can do to keep your mailbox whole and functional. You can keep your mailbox from being smashed by outwitting the vandals. Buy a thicker mailbox. 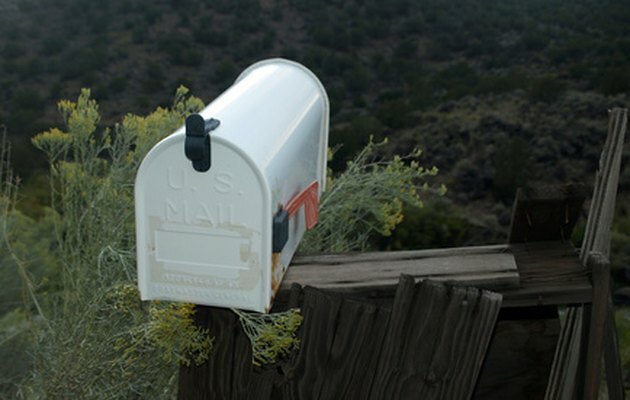 Standard aluminum mailboxes are easily crushed by a baseball bat or other object. Buying a thick stainless steel or other heavy metal mailbox will prevent or minimize damage and allow your mailbox to remain functional and possibly dent-free even after a smashing attempt. Add a dummy mailbox. Place a second, identical mailbox next to your working mailbox, but make the post higher so the dummy mailbox stands taller than your working mailbox. Fill the dummy mailbox with cement. In a quick drive-by smash, the baseball bat wielder is likely to go for the easy target--the taller, cement-filled mailbox. Encase your mailbox in a protective wood or metal casing. Using scraps of 2-by-4 lumber or rebar, build a cage or house for your mailbox that will withstand a beating by a baseball bat. Attach the casing firmly to your mailbox and post; it won't work if the vandals can easily remove it. Rhomylly Forbes has a bachelor's degree in communications from the University of Wisconsin-Green Bay. A freelance writer since 1997, Forbes has been published in A&U Magazine, Romantic Times Book Lovers, Old-Time Herald, and Celtic Heritage. She has been writing online professionally since 2008. What Pests Are Afraid of Owl Statues?